Soft tissue injuries are some of the most common types of injuries victims of Miami car crashes sustain. Soft tissue injuries generally fall into one of three categories: sprains, strains, and contusions. Whiplash, otherwise known as “hyperextension” or “cervical strain/sprain,” and neck injuries, which fall into the sprain/strain categories, are some of the most common types of car accident injuries for which our Miami car accident attorneys help clients recover compensation. Though many people dismiss whiplash as a minor injury, the truth is that though the condition is not life-threatening, it is painful, and it can have a major negative impact on your daily life. If you or a loved one sustained whiplash or any other type of soft tissue injury in a recent car crash, reach out to the team at Spencer Morgan Law to learn more about your recovery options today. Whiplash, as its name implies, occurs when the head and/or neck is violently jolted back and forth during sudden impact. Though a high-speed collision can result in severe to catastrophic injuries, even low-speed collisions can cause whiplash. Sometimes, the symptoms of whiplash appear right away, but other times, they can take hours to days to develop. Some cases resolve on their own over the course of a few weeks to a couple of months and without any intervention. Others, however, require ongoing physical therapy, muscle relaxant medications, and several months to heal. When these symptoms occur, it is unlikely that the condition will go away on its own. Rather, victims who get to this point often require physical therapy and pain medications, both of which are expensive and can disrupt one’s work and personal lives. 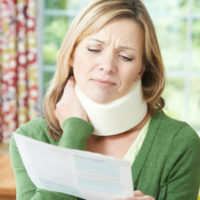 If you live with the symptoms of whiplash because of a recent car accident, you know just how disruptive the condition can be. While you could take the wait-and-see approach and hope that the condition resolves itself, doing so could be a huge mistake. As mentioned above, severe whiplash can take a toll on your daily life, and you may need intervention to alleviate symptoms. If you wait to see how your symptoms progress, you may miss out on your opportunity to sue the negligent party for damages. Do not let this happen. If you were involved in a car accident, and if your doctor diagnosed you with whiplash, take all the measures you would take if you sustained more severe injuries. Keep copies of your medical records, make note of missed work days, track physical therapy costs, and document your pain and how it impacts your daily life. Your documentation can go a long way toward proving your claim and maximizing your recovery should you choose to pursue a personal injury claim. Most importantly, contact a Miami car accident lawyer. An experienced attorney can evaluate your case and determine if it has merit. If it does, he or she will help you pursue the compensation you need to attain the recovery you deserve. Contact Spencer Morgan Law to speak with such an attorney today.